APEC 2015: EastWest Bank Schedule on November 18 & 19 - Balita Boss! Here is the bank schedule of the EastWest Bank for APEC Summit on November 18 and 19, 2015. 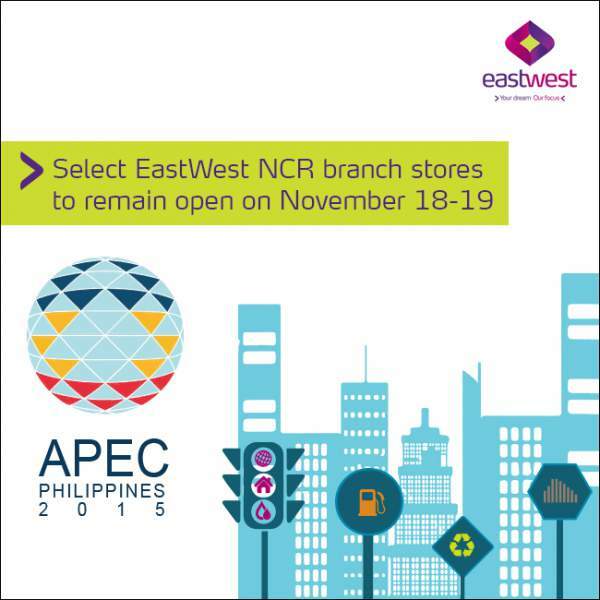 For all branch stores located outside of NCR and not covered by the APEC holiday. Also, our over 500 ATMs will be operational round-the-clock. You may also check your balances, pay bills and transfer funds 24/7 through EastWest’s online banking facility.